An article in Psychology Today, a popular blog run by psychologists and psychiatrists, notes that overworking can lead to burnout. This is when a person can no longer handle the stress they operate under and cave in from physical and mental overload. This often induces a period of fatigue and depression (which aren’t rare among teenagers anyway), and this can be difficult to overcome. I’ve experienced burnout once, and I see friends go through it all the time. While burning out right before summer break is fine, as the holidays can be the perfect time to recover, burning out before an important exam or interview can be disastrous. The ensuing panic can elevate stress further, hindering recovery; burnout can make or break you, and it is vital to find regular outlets for built-up stress. There are definitely days where intense work is needed, such as before important exams and immediate deadlines. But there are many ways to recover from work-heavy periods. Here are some suggested methods to easily reduce stress, and give your brain a rest from rigorous studying. By far, the most common method is exercise. I allocate an hour to exercise every day (except during exam season); exercise, apart from keeping you healthy, also releases chemicals in your brain that elevate your mood, relieving pain and stress. Another way to wind down is allocating some time every day to do something you enjoy, whether it be video games, reading or eating your favorite food. Your body and brain will recover faster if you inject regular fun into your schedule. When you think of snacks, you probably think of a big packet of crisps, or a chocolate bar. Granted, eating junk food makes us happy – research has proven that their specific tastes and smells inhibit stress levels and enhance our mood. There is a catch; junk food makes us feel good temporarily. In the long term, however, junk food triggers the secretion of stress-inducing hormones in the brain; since we associate junk food with feeling happy, we turn back to junk food as an escape from stress, which in turn increases stress levels. Moreover, junk food usually leads to weight gain, which stimulates negative self-conscious thoughts, and elevates anxiety. On the other hand, healthy food promotes the secretion of mood-elevating chemicals – without going into too much detail, it slows down the absorption of sugar into your bloodstream. Junk food adds to your long-term stress; healthy food decreases it. Like healthy food, spending time outside is vital for preventing and controlling anxiety. Nature, including trees, plants and even natural sounds (like birds chirping and water flowing), causes our brain to release “feel good” chemicals that help us relax. Try it yourself. When you’re feeling really stressed, go for a walk in the park. I guarantee you’ll feel better in just a while. Research done on children in Barcelona has revealed that the more time they spend in nature, the less likely they are to have behavioral issues in the future. So when you feel stressed, get outside your house and enjoy nature. If you live in an industrial area, try growing plants at home. Who knows, gardening may become your new favorite hobby! Music should be a mandatory part of your day. Invest in good sound equipment, and watch how your stress levels drop. It doesn’t matter what type of music you listen to – as long as you enjoy it, you will find it a good method to relieve any built-up stress. Remember to be aware of your surroundings though. If you decide you’re going to alleviate your stress by blasting rap music on the Beijing Subway, then don’t blame us when you get arrested for public nuisance. When you’re feeling too stressed, it’s always a good idea to stop what you’re doing, and do something else. Teenagers may sleep more, and adults may have a night out with their friends. However, it can be beneficial to do something more useful with your time. Many of us have daily household chores. Instead of allocating a fixed time to this everyday, try completing your chores bit by bit throughout the day. After working for fifty minutes, take a ten-minute break to clean your room, or take out the trash. Although many of us have ayis, everyone can use some help. You’ll also feel better when you have finished all your work early and have some time to yourself. There are always people in need of help, either in your neighborhood or on the opposite side of the world. Whether you’re a teenager or an adult, it is our responsibility, as mindful global citizens, to offer help. There are countless volunteering organizations that you could be involved in. Many high schools offer opportunities to volunteer, and most students have volunteered at least once, whether for local or international projects. Additionally, there are organizations that arrange volunteering trips over summer, and schools often encourage students to raise funds for self-organized volunteering trips. If you’re not able to finance an overseas volunteering trip, then volunteer in your community. Volunteering locally can be just as valuable as working overseas. Regardless of whether you’re a parent or a child, remember to spend some time with your family. As students stress about final exams and scramble to submit college applications, and parents worry about interviews or meetings, family can be easy to neglect. But while it’s important to set goals and achieve them, it’s just as important to take some time off for yourself, family and friends. They’re more important than your work any day. Finally, remember to do something you enjoy every day. And if you can’t do what you love, then love what you do. 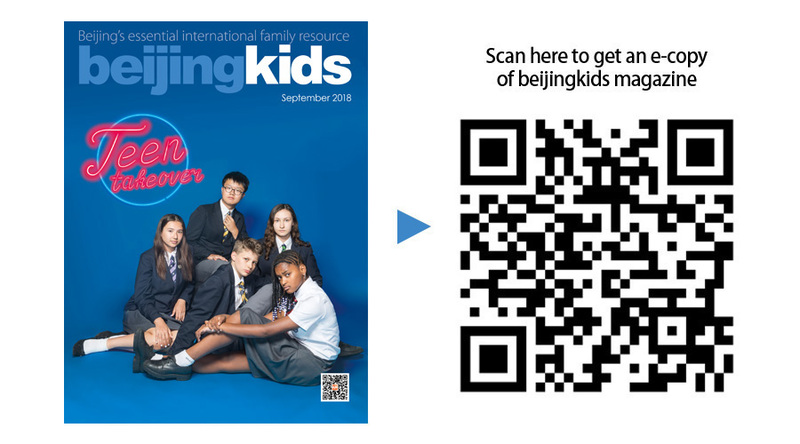 A complete version of this article appeared on p53-56 of the beijingkids September 2018 Teen Takeover issue.